This is a scalable context timeline. It contains events related to the event (Between 9:04 a.m. and 9:36 a.m.) September 11, 2001: Defense Secretary Rumsfeld Ignores His Aides’ Attempts to Get Him to Respond to the Attacks. You can narrow or broaden the context of this timeline by adjusting the zoom level. The lower the scale, the more relevant the items on average will be, while the higher the scale, the less relevant the items, on average, will be. Aides Tell Rumsfeld What They Know about the Attacks - After they enter Rumsfeld’s office, Clarke and Di Rita tell the secretary of defense what is happening and what they know about the attacks. They say the Executive Support Center (ESC) “is going to start getting spun up.” [Historical Office, Office of the Secretary of Defense, 6/27/2002 ; Historical Office, Office of the Secretary of Defense, 7/2/2002 ; Clarke, 2006, pp. 216-219] The ESC is a secure communications hub with a video teleconference facility, located on the third floor of the Pentagon. 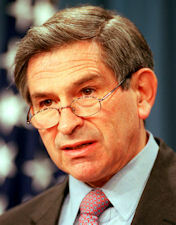 [Historical Office, Office of the Secretary of Defense, 6/27/2002 ; Vogel, 2007, pp. 440] It is “the place where the building’s top leadership goes to coordinate military operations during national emergencies,” according to Clarke. Senior officials in the Executive Support Center (ESC) at the Pentagon decide against evacuating the Pentagon, despite being aware of the attacks on the World Trade Center. [Historical Office, Office of the Secretary of Defense, 7/2/2002 ; Eichenwald, 2012, pp. 22] The ESC, on the third floor of the Pentagon, is “the place where the building’s top leadership goes to coordinate military operations during national emergencies,” according to Victoria Clarke, assistant secretary of defense for public affairs. [Clarke, 2006, pp. 219] Those currently in it include Clarke; Larry Di Rita, Defense Secretary Donald Rumsfeld’s special assistant; Stephen Cambone, principal deputy undersecretary of defense for policy; and William Haynes, the general counsel of the Department of Defense.